Apple trees are beginning to leaf out, tho bl;ossoms are late this cool, wet Spring. Hickories beginning to flower, and along with them allergies. Marsh marigolds are open in bright yellow delight. Skunk cabbages purpley. Birds singing everywhere. Spring also brings abundantly healthy forage food: nettles are great right now, ramps are bulbing out, and spring rocket hasn’t quite turned bitter. And there’s more to explore and sample. While I enjoy gardening, eating what comes up naturally is even yummier. Have been blessed with plenty of teaching-practicing opportunities. 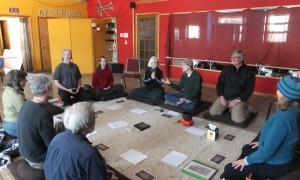 On-going Middle Way series with Tender Shoot of Joy in MKE, monthly visits to La Crosse and Eau Claire, Insight Chicago retreat near where I grew up, and a newly launched Sutta Study program in Chicago (details posted one of these days). The image below is from Wild Peace Sangha in Viroqua, where I’ll be visiting again later this month. This entry was posted in Garden, Plants, & Ecology, General. Bookmark the permalink.